AquaBounty created AquAdvantage salmon 25 years ago and the company has been awaiting FDA approval for some time. If the agency deems the salmon safe, the product would be the first genetically modified meat available for human consumption, and could become available at stores as soon as two years from now. The regulatory agency has not yet made the final call or provided a timeline for when it expects to announce its decision. AquaBounty produced the fish by altering Atlantic salmon with genetic material from Chinook salmon and Ocean Pout. The latter is an eel-like species of fish that has antifreeze proteins in its blood, allowing the animal to survive near-freezing waters and continue to develop. This helps the genetically modified fish survive harsh elements and produce growth hormones all year. "Most producers will say it takes 24 to 30 months to produce a market size salmon. We can do that in 18," Ron Stotish, CEO Of AquaBounty, told CBS News. "This is a generation of technology that can improve productivity, can improve availability of food worldwide." But some environmentalists and food safety experts are concerned about the repercussions of this venture. Michael Hansen, a food scientist at Consumers Union, says he worries the fish could produce allergic reactions, and also wonders what would happen should the fish escape into the wild. "That could cause genetic pollution and have an adverse effect on the natural salmon population," he told CBS News. However, early reports from the FDA say the genetically modified fish are safe for humans and the environment. A number of grocery store chains, including Kroger, Safeway and Whole Foods, have already told the company they will not carry the fish. "We're disappointed," said Stotish. "The product, we believe, will succeed once consumers have an opportunity to sample it." For some time, scientists have been experimenting with how to harness technology to tackle food shortages; genetically modifying animals may be the next frontier. Last summer, a hamburger made headlines when researchers grew the red meat in a petri dish with stem cells from two organic cows. Currently at least 90 percent of the corn and soybeans grown in this country are genetically modified, which has been a top concern for food safety and environmental experts. The concept of altering genetic material to increase or improve food supplies also angers and baffles consumers. As a result, some lawmakers are taking action. Last week, Vermont Gov. Peter Shumlin signed a bill that will require companies to include GMO labels if a food is genetically modified. A number of other states are expected to follow suit. Some organizations propose this may be necessary if AquaBounty earns FDA approval for their fish. Last week the Center for Food Safety released a statement about the pending approval. 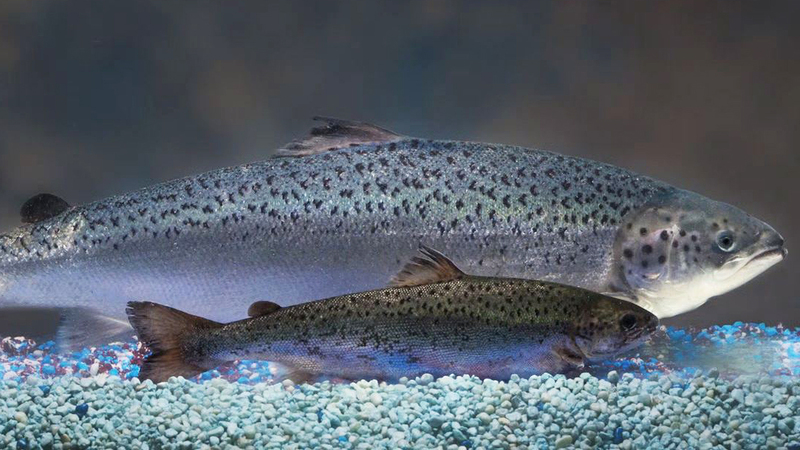 "Should the FDA decide to approve the AquAdvantage GE Salmon, clear, mandatory labeling is an absolute must to allow consumers to make informed purchasing decisions."